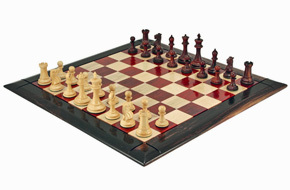 For those who want something extra special our range of luxury Staunton chess sets is certainly worth a look at. You might be wondering what makes a Staunton chess set luxury. We only give a set the 'luxury' tag if it deserves it. 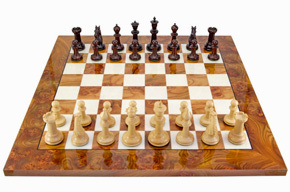 Our luxury chessmen are all made from rare and valuable exotic hardwoods. Each piece is turned, carved and polished to an almost impossible level of finesse and detail. The four knights in the set often dictate how much of a luxury the set will become. The carving of the knights is the hardest and most time consuming job. Each one is hand carved and needs to be identical to the others in the set. In some cases the level of detail extends as far as hair, teeth and pupils in the eyes of the horses. All of our luxury chess pieces are internally weighted for the most ideal weight, and balance. The piece needs to feel perfectly balanced on the board and tactile to hold and move. The centre of gravity in these pieces needs to be perfect, the result is that they are a pleasure to play chess with. All of our luxury Staunton chess sets combine our fine chessmen with high quality boards that are sourced from local European suppliers. The result is an array of fantastic chess sets that look absolutely stunning.